It's that time of year again! 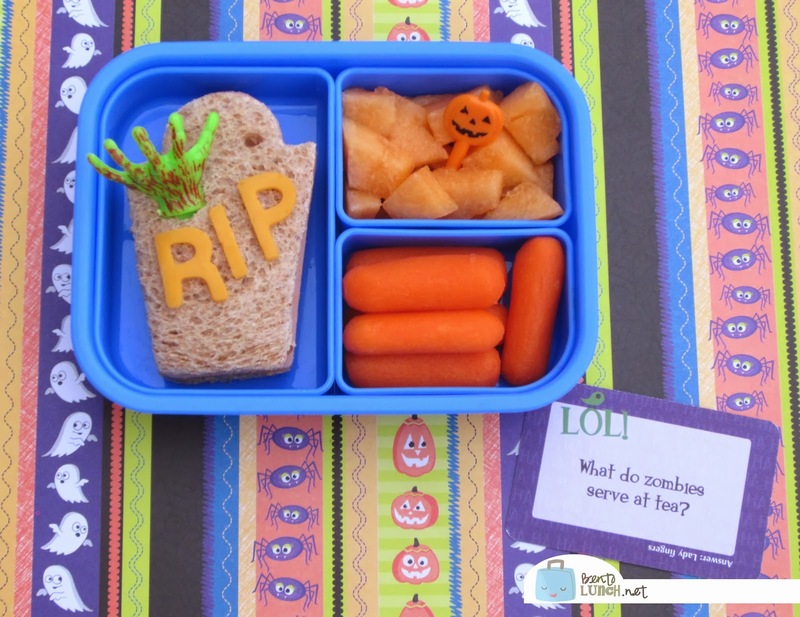 And I promised my boy a zombie lunch, especially once he found the zombie joke in our Lunchbox Love cards. I had more grandiose plans in mind, but a little thing like moving took that place. Instead, I went with simple so my zombie loving boy could have his zombie lunch. Ben took a ham and cheese coffin sandwich on whole wheat bread. Like any proper coffin, it has RIP on the lid, and like any proper zombie filled coffin, it has a hand climbing out of it. To the right, he has cantaloupe with a pumpkin pick and carrots, which really have no Halloween purpose. He also had a Squeez-ems of applesauce, a tube of Chobani Champions, and a granola bar, none of which are pictured, because they aren't that interesting. 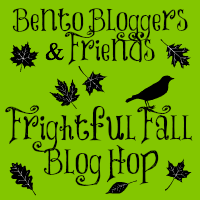 However, this is a blog hop, and I can pretty much guarantee my bento friends have much more interesting things cooking on their blogs, so while I head back to digging through boxes, click on the button below to check out what Becky at Food for Harper is making! Nice lunch! Love your use of the color orange! Cute (not sure that's the right word for a Zombie lunch) bento!! I hope the move is going well! Great lunch! Just love that creepy hand as well! That grave is amazing. What a great idea! Super fun. Love your lunch! Looks great! Love it! Great zombie lunch. Nice zombie lunch! Glad you were able to dig out from the boxes long enough to join the hop. Perfect zombie lunch! Love how you mentioned the other foods not pictured because of their interest level ;) you're so funny! Love the coffin sandwich with the creepy hand idea! Love the zombie hand!! Awesome lunch! Very cute! Love the Zombie picks! The hand is great, and the lunch is so simple you have to love that! i love it! that zombie pick is the best! I sooooooo need that zombie pick! That is the BEST halloween accessory!